6_34_3_58_x_6_12_Closeout_Envelopes is rated 4.6 out of 5 by 5. Rated 5 out of 5 by Sister from Exactly as described Bought this item for a church function. Committee liked it a lot. Rated 4 out of 5 by Shee Shee from Met My Expectations Perfect Envelopes. Unneeded Pink and Smaller sized. These worked perfect for a Women's Pink Event I hosted. Sealed wonderfully and ran through copier without sticking or jams. Rated 5 out of 5 by GCCG from PERFECT! the envelopes work perfectly for our needs. they were just the right size for what was need. I actually printed our design along with the text and everything fit perfectly. ( with a little adjusting of course). but we couldn't be happier with the product. I sorry I don't have a photo to upload. But believe me that are exactly what we were looking for. The color (Astrobright Martin Green) was right on point. Thanks again. May order more in the future. Rated 5 out of 5 by Cynde Swims from Nice color Nice envelopes, great color. More vivid than it showed on my screen. Rated 4 out of 5 by KCap from Unique envelope sizes I needed a not so common size envelope and I was able to find the perfect size from JamPaper. The only thing I would change would be more color selection. Whether you are sending individual letters from your home or sending out mass mailings from the office, #6 3/4 Closeout Envelopes are the perfect choice. Want to know why? Well then, read on! 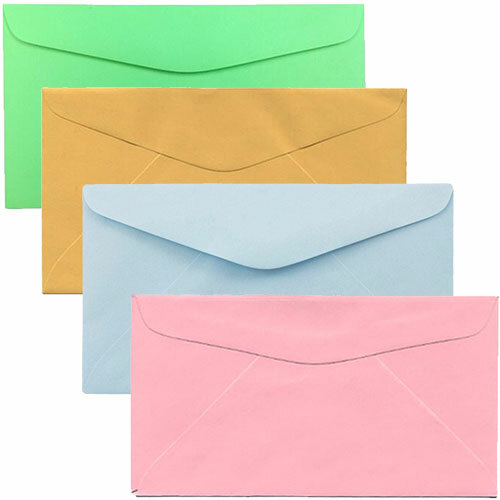 3 5/8 x 6 1/2 envelopes feature a gummed closure v-flap, ideal for every day mailing and secure enough to fit your letters, invites, or promotional mail for your business. Available in seven colors, you can be sure to find a style that’s right for you. And trust me, we're color experts, so these colors will surely make a statement you've been looking for (whatever statement that may be). #6 3/4 Closeout Envelopes measure in at 3 5/8 x 6 1/2 and ship in quantities of 1000. Items can be listed on a closeout for a number of reasons from a color change to a discontinuation. Because of their closeout status, these envelopes are priced lower and sell in mass quantities, perfect for those trying to stock up and save up!